Advanced PLC integrated with a 4.3″ wide aspecr color touchscreen. Includes an onboard I/O configuration; expad up to 512 I/Os. 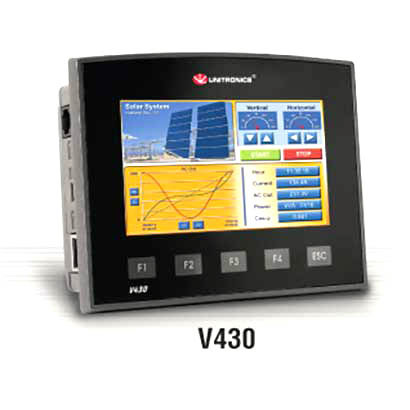 The award-winning Vision controller series welcomes its newest member—the Vision430™. The beautiful, wide 4.3″ built-in color touchscreen brings added value to any application that requires a compact PLC controller with onboard I/Os. The touchscreen and five function keys are housed in a flat fascia with an IP66/IP65/NEMA4X rating—a fine fit for the food and pharmaceutical industries. The machine operator communicates directly with the application via the resistive analog touchscreen—or remotely, via the free Remote Operator utility—which displays data, color trend graphs, and attention-grabbing alarm screens. Display options are almost endless, with more than 1024 user-designed screens supported by 12 MB of memory for images and 1MB for fonts. OEMs and machine builders profit from intuitive, all-in-one VisiLogic software that enables rapid hardware configuration, PLC, and HMI application programming. VisiLogic includes a full library of Drag & Drop function blocks for complex automation control tasks, such as PID, and a rich, FREE color library of industrial images.